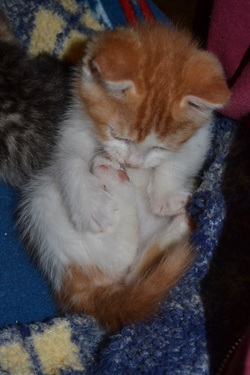 Joe is one of ten kittens that were abandoned in the middle of a road, in the woods, with no hope of survival. Luckily, the good people outnumber the bad, and he and his 9 siblings were all taken to a BCR foster home! Joe's foster mom believes that he is a unique and special kitten, who will make his person so very happy. He is a cuddly purr-bug of a kitten, with a definite adventurous streak! He loves other cats, and is an enthusiastic stalker of feather toys on sticks. Do you have a place in your heart for Joe?